JUSTICE LEAGUE VS. 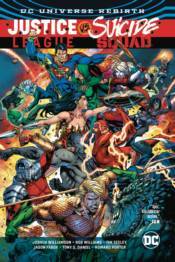 SUICIDE SQUAD is here in this title collecting stories from JUSTICE LEAGUE VS. SUICIDE SQUAD #1-6, SUICIDE SQUAD #8-10 and JUSTICE LEAGUE #12-13. The Justice League has discovered the existence of the Suicide Squad, and the World's Greatest Heroes can't let that stand! But Amanda Waller and Task Force X won't go down without a fight!